Last week Gary and his brother, David, made the final cuts on the great White Oak and left about 10’ of the trunk standing. While standing in the bucket of a bucket truck they removed chunks of wood slowly and carefully and lowered each into a trailer. When they finished, they counted the rings and gave 162 as the final count. This process took a very long time and at the end we discovered we had a bucket with about 3’ of sawdust, the rock garden with about 8” at the base of the tree, and a light coating throughout the entire bed. Fearing death to many plants and a major impact on the garden itself, we decided to remove the sawdust if possible and began picking it up and putting it into containers. Realizing this job might last for months, Gary suggested vacuuming with a heavy-duty shop vacuum cleaner and we began the process this week. The top layer was relatively easy to remove but the lower, wet parts were harder so the current plan is to work slowly and remove the sawdust as each section dries between showers. When we finish, we will spread coffee grounds over the entire area to replace some of the nitrogen lost during the decay process and plant clematis which we hope will climb on the trunk along with the Schizophragma hydrangeoides ‘Moonlight’, and put a birdhouse on the top. Now is the time to pollinate primulas so we went back to last year’s plantings along the new primrose path through the woods where, to our delight, we found healthy plants with lots of flowers. Each day we choose the best of our favorites, find a pin-eyed and thrum-eyed plant, transfer the pollen, then make a note of the location. Hand pollination is much more likely to give the result we want so we don’t miss an opportunity to increase our numbers. We have had three successive frosty nights, and hope they will be the last of this season. Each day brings forth emerging buds at ground level, newly opened flowers on trees and shrubs, and swelling leaf buds throughout the garden. Yellow, chartreuse, and shades of pink and purple are the main colors but there are subtleties of shades. Along the edge of the field on the west side of the property masses of daffodils bloom, many of which haven’t been divided during our forty-two years here. They were planted in rows as if in a furrow made by a plow and always make us think of the very first spring which was one of discovery. We found other old forms throughout the garden that year, even some in the woods, most of which have now come into the main planting. This is an excellent time to divide bulbs—better in many ways than waiting until the bulbs settle down. We can see where they are needed, where others are growing, so we don’t dig into dormant clumps in late spring, and can see those which are struggling in their current locations. When we look up, we see the fluffy, pale pink flowers on weeping cherries, deeper pink ones on peaches, and magenta redbuds, the earliest being Cercis siliquastrum. The freshest of chartreuse leaves on the willows hover over the Blue and Yellow garden. 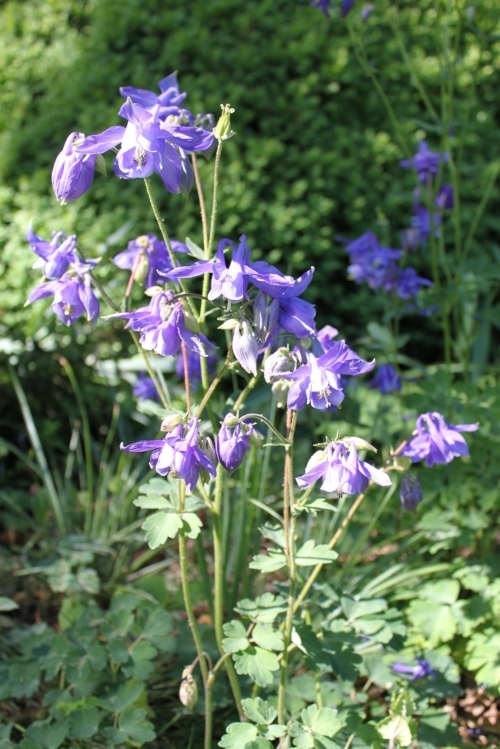 Small fluffy corydalis in white or shades of blue or red spread throughout the woods and are a welcome invitation to bend lower. Trillium pusillum var. undulatum opened with wavy edges and tinges of pink on the underside of the petals. This is our most exciting trillium because it is one of several which is spreading through various sections of the woods. We found a large patch, smothered by hellebores, rescued it, divided the clump into sections, and planted them in the newly cleared triangle near the pond. Trillium decumbens is as beautiful in leaf as in flower. Medium green leaves hover just above ground with their bloom buds vertical looking as if they are about to expand and they are! T. cuneatum has opened in many places, but is still tightly closed in others. Anemone blanda, always a welcome sight in the woods and in the rock garden, is being smothered by Ipheion uniflorum now naturalized beneath the metasequoias and spreading into the nearby lawn. Carefully we dig out the tubers and replant them away from their invasive neighbor. The flowers come in white and shades of blue and pink and dig out others seedlings that appear in the road and paths in the woods. Blood-root stops us in our tracks to look and compare the flowers. A quick glance reveals a brilliant white flower, but upon closer inspection we see extraordinary differences—more petals, wide or narrow forms some with tinges of pink, and early or later appearances. At this season, we go down to “the bottom” of our land where snowflakes have now replaced the snowdrops and Hyacinthus orientalis are at their peak. We found both of them on this property but have added other forms to extend the blooming period. Both are naturalizing through seeds and division. Seeds are most exciting because that way we may produce something different, perhaps even better. Nothing could be better than to be here in the garden at this season. In February, we expect to see the peak of our winter flowers and this year is no exception. Witch hazels are in full bloom and best viewed when backlit with the sun. Hamamelis x intermedia ‘Jelena’ can look dull when seen up close on a cloudy day, but brilliant when the sun shines through its wispy orange petals. H. mollis ‘James Wells’ retains its leaves but brightens the driveway edge with fragrant yellow flowers. The late snowdrops don’t match the earlier displays at Montrose, but a large planting of Galanthus gracilis produces a gentle flow of twisting gray green leaves and small, but numerous flowers. Large drifts of unnamed varieties give us one last excuse to crawl about and look for “the different ones” to transplant for increase and future drifts. Most of the double flowered forms are late to open their green and white petals often with intricate patterns such as those on G. nivalis ‘Blewbury Tart’. 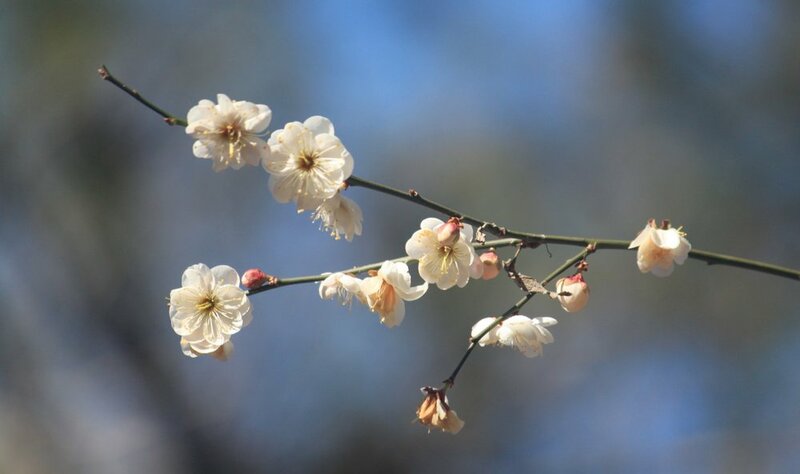 Many Prunus mumes produced fragrant flowers throughout January and February although some of the flowers were ruined by cold nights while others were discovered more by their incredible fragrance than by their flowers. Magnolia x ‘Donna’ just cannot wait for spring and has many opened flowers. We know the next freeze will turn them brown but we finally learned to be grateful for little blessings and enjoy them whenever they open. Colchicum hungaricum ‘Valentine’ bloomed right on schedule and remains full of elegant, small lilac flowers with more buds yet to open. Throughout the woods many hellebores are at their peak, so we continue to pollinate some of our favorites—mostly species. Tiny Narcissus cyclamineus requires a special visit in order to see its tiny flower. We had to have the daffodil shaped like a cyclamen, although increasing it is difficult. The small, but profuse Crocus tommasinianus has seeded into the lawns, woodland paths, and throughout the rock garden. Most often we leave them where they choose to grow, but we rescue those in the lawn and plant them in the woods where they grow and bloom with cyclamen, hellebores, and the last of the aconites. Jasminum nudiflorum, January jasmine, has been very slow to open this year. I found only one flower on Christmas day so it seems more like a February jasmine this year. We are about to reduce the size of our hedge, which has insinuated itself into an adjacent bed filled with sternbergias and into the lawn near the garage, thereby almost closing the path. It is time for editing! There is no question about it. Winter, with its unpredictable timetable, has arrived. This week we will have daily temperatures near or below freezing with high winds and also at least one day when we approach 70°. We are often asked when the garden will be at its winter peak. In general that happens during the second week in February and it looks as if that will happen this year. Adonis vernalis has two fully opened flowers with more just emerging from the ground. Helleborus niger line the Mother-in-Law walk and Hh. vesicarius and thibetanus have flowers ready for pollination. Some of the other species bloom now—Hh. purpurascens, dumetorum, viridis, orientalis, cyclophyllus, and odorus, and hellebore hybrids bloom throughout the woods. We continue to cut off the old leaves, which sometimes seems a Herculean task but it is worth the trouble. We get down at ground level and look into the interior of the flowers. Our large planting of Galanthus gracilis has created a carpet of grey-green leaves and tight buds of pure white petals held together with a green spathe. A warm, sunny day will see them open. The “amphitheater” has masses of Galanthus nivalis and aconites (Eranthis hyemalis) in bloom. Most of our aconites have brilliant yellow flowers but some have pale yellow ones. The pale ones just appeared here by chance after our initial planting about 30 years ago. We are just waiting for purple crocuses, miniature daffodils, and Cyclamen coum to complete this display. Cyclamen coum has been slow to open this winter. I can still count the number of flowers open but within a week or so there should be drifts of carmen, pink, or white flowers in many sections of the woods. Throughout the garden a few Prunus mumes have open flowers while other forms have buds open far enough to indicate the color of their blossoms. A few young seedlings have made their debuts in the woods. This small tree has always been a sign of spring in mid-winter, long cherished, but often damaged by below normal temperatures. Daffodils bend to the ground on cold mornings but usually straighten up as the temperature rises. There are more and more in bloom and each one seems a miracle. Each day brings forth new growth, more flowers and a new appreciation of this, my favorite season. Christmas was a lovely, cold day and I spent it listing the flowers in bloom. I had anticipated the day and kept an eye out for promising buds but when the day came, I found fewer open flowers than usual. The daffodils which had bloomed earlier, were droopy because of recent freezes; most of the white quinces had promising fat, white buds, but without a stamen in sight. It was especially disappointing not to find a single Christmas rose—not a hellebore or a rose. The disappointment of that day was quickly forgotten as more and more hellebores opened their flowers in the next few days. More cyclamen and narcissus bloomed and the fragrance of Chimonanthus praecox filled the air along the driveway and along the mother-in-law walk. X Sycoparrotia semidecidua lives up to its name with yellow leaves and swollen flower buds along its branches. The parrotia parent gives last year’s leaves their bright yellow color and early winter endurance. Galanthus plicatus‘ Three Ships’ made its proper statement on Christmas day and more and more snowdrops bloom now with Galanthus gracilis filling an area in Stubble Field, hybrids growing south of the large planting of G. elwesii var. monostictus and several large groups of G. elwesii Edward Whittall Group almost at its peak. Last week we began cutting back the hellebore leaves from last year. When the flower stalk is taller than the old leaves, I believe they no longer give the flower buds any protection and there are several reasons why we believe it is best to cut off old leaves. They may harbor fungus, which can remain viable in the soil and affect additional plants. The leaves hide some of the flowers as the stems lengthen and may smother many small plants, such as aconites, anemones, and cyclamen that bloom at the same time. Aconites and Crocus sieberi opened last week–more than 2 weeks later than usual. We began clearing the sections of the woods where we left off last winter and removed fallen sticks and branches, dug ivy, periwinkle, honeysuckle, small and unwanted trees, and removed some hybrid hellebores and epimediums. Part of the challenge of gardening is to recognize when desirable plants outgrow their designated places. 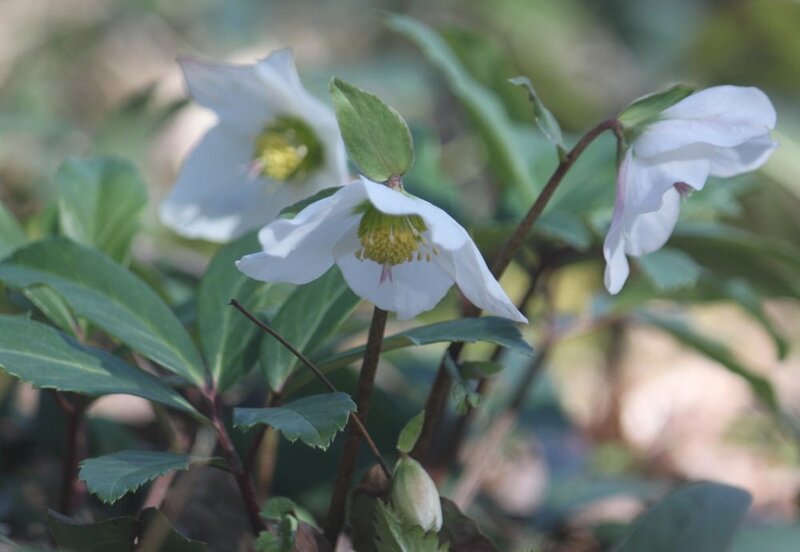 Some hybrid hellebores and the matting forms of epimediums can produce a controlled area where nothing else can grow, but they are too great a challenge for cyclamen and other less vigorous plants. We love this season and spend every minute we can searching for flowers, planning for next year, and, of course, we have another group of snowdrops to divide and plant in a new area. We had perfect weather for our snowdrop walk in late November. The only problem was that the snowdrops were not at a peak. This week they will be at their 2018 peak, because no two seasons are alike and this year they were slow to open. We have three species of galanthus in bloom now: the early flowering Galanthus peshmenii, and G. reginae-olgae, both of which had flowers in late October. Several weeks later we saw the tips of G. elwesii var. monostictus and now they are fully open. I first obtained this form of snowdrop just after Thanksgiving in the late 1980’s when I purchased a package labeled “snowdrops” on sale at The Farmers Exchange (now Southern States) in Hillsborough. I planted the bulbs under the metasequoias and expected to see flowers in mid-winter. That first year, I saw nothing but leaves, but the following year I was shocked to see flowers in late fall. At that point in my gardening life I knew nothing about fall blooming snowdrops. When the original plants multiplied into clumps I decided to see if they would grow at the edge of the woods. By this time, 1998, we had begun to clear the area just below the aster border and I had space with large trees but little undergrowth. The bulbs quickly multiplied into clumps with many flowers, so in 2003 I imagined the woods full of snowdrops and began dividing and replanting them about a foot apart, one bulb to a hole, at the northeast corner of that section. Year after year, with my gardening helpers we divided the largest clumps until we declared The Snowdrop Woods full. Following that we did a mass planting of this same form of Galanthus elwesii at the top of one of the ridges where the land had been terraced for erosion control in the 1930s, so in 2009, we planted the ridge near our cyclamen walk. After that we planted across the slope above the ravine between the western edge of our property and woodland garden. And last winter, 2017, we put more than 4,000 bulbs on the southernmost ridge, above the flood plain. By this time, we realized we had many forms of this snowdrop, which leaves us crawling along all of the plantings to look for “different” ones—those with faces, or more than one mark on the cup of inner tepals (petals). We have a new planting of snowdrops with faces (3 years old) in an entirely different section of the woods, which we call Holly Ridge, and are still waiting, more or less patiently, for them to increase enough to divide. Before these snowdrops finish blooming, we will have other species and varieties in flower and we look forward to seeing at least some galanthus until late February or early march. No, I will not cover the entire woods with snowdrops, but I am not finished yet! Hurricane Michael left more destruction than Florence. We had relaxed because we expected only prolonged rain and we did have that; however toward the end of the day the winds increased and brought down some of the largest trees in our woods. A poplar fell across two fences; osage orange (Maclura pomifera) crushed the compost pile; the top fell out of one of the cypresses near the animal shelter; and a very large oak broke off at the base and lies at a right angle across the nearby trees. We were fortunate. There is no damage to the house, buildings, or garden. Due to the storm, we are later than usual removing microstegium in the woods. In fact everything is late, even crocuses, but finally we have C. caspius blooming beneath Cedrus deodara and in the lawn in front of the house. White tinged pink flowers with a bright yellow throat mean, “watch your step”. C. tournefortii has flowers mixed with Cyclamen hederifolium beneath the metasequoias and has spread into the lawn nearby as well as into the dianthus walk and beyond. We don’t grow Crocus sativus easily. We have only one corm in the rock garden with a flower. C. speciosus blooms in many shades of purple-blue as well as white and brightens the rock garden and the cyclamen walk. C. boryi, beneath the metasequoias, has a small mass of cup-shaped white flowers. The first snowdrops finally bloomed yesterday in the woods—well, almost bloomed. I could see clusters of flower stalks with pointed buds facing up. Galanthus reginae-olgae and G. peshmenii confirmed that fall is really here! The best news of the past month is the newest member of our family. Mazie, a small black, white, and brown dog came to live with us just before Michael arrived and now welcomes our visitors with a bark and a wagging tail. We watched with great anxiety as Florence was predicted to make a direct hit on Hillsborough and felt a sense of relief as she changed course and headed south. Winds and showers from the storm arrived on Friday morning, September 14, and quickly brought down one of Hillsborough’s oldest and largest oaks. It fell across the power lines and sent the town into a power crisis. Because the tree was too large for the town crew to handle, we remained without power for the day. Montrose was fortunate to have a generator so life went on, without helpers but with little disruption, inside the house. We thought the worst was over until Sunday, when the winds picked up and heavy rain fell without pause. The Eno River overflowed; paths through the woods became waterways; but our major trees remained upright. The gardens were littered with branches of every size and we continue to pick them up, but we believe we were fortunate. Cyclamen bloom as if nothing happened. Sternbergias opened their flower buds, and most of the colchicums look fresh and unblemished. We cut back the damaged perennials in the sunny gardens and we almost look as if Florence never appeared here. It seemed to happen overnight—light comes later in the morning and darkness earlier in the evening. Colchicums brighten the boxwood border and the woods are filled with cyclamen flowers. The first sight of colchicum flowers is the perfect time to move and divide their corms. Colchicums seem out of sync with most bulbous plants. They bloom before they make their roots, so they will settle into another site quickly. Flowers continue to open and roots appear shortly thereafter with no disturbance. Our attention turns to the woods and, although we still have much to do in the sunny gardens and nursery, we spend the hot afternoons in the shade pulling microstegium. We have made progress eliminating that pesky grass in several areas in the garden by pulling it out before it goes to seed. After we first cleaned off the snowdrop woods, we began on the ridges beyond. When we find bulbs above the soil we plant them in a new place. Nyssa sylvatica, the tupelo, or black gum tree, already has a few brilliant red leaves and we continue to prune and shape up some of the smaller trees, including corylopsis, hamamelis, and loropetalum. Visitors are welcome now that the sunny gardens have matured and tender plants, set in place in June and July, have settled in with fresh new leaves and flowers. Many of our pots and urns planted with tender plants finally look as we hoped they would. Although we prepare for the approach of Hurricane Florence, we continue to work as if tomorrow will be as pleasant as today. Lovely, much-needed rains came and left the soil damp but not hard. New plants, recently set in the ground, perked up. Grass turned green again and our spirits were uplifted. We mulched all of the sunny gardens with the leaves from last fall and planted the color gardens. We turned our attention to trees and shrubs and pruned out dead and misshapen limbs and water spouts and finally we focused on the giant Juniperus virginiana that grows in full sun north of the driveway. This is a major tree at Montrose and was host to weedy vines including grape, ivy, poison ivy, and virginia creeper. We dug pokeweed, and Geum urbanum, that weedy little geum with seeds that cling to gloves, other clothes, and to Angie, our aged dog. We pulled out lots of trees including a mulberry, dozens of nandinas, privets, and ash trees and then we stood back and saw the tree as we had never before seen it. We measured it and discovered that it is 70’ high, with a tree canopy of 58’, a circumference of 16’ (192”), and diameter of 6’. We believe it is our largest and oldest tree and we feel honored to live with it. We began our attack on two major pests in the summer gardens—an inula species and Anemone canadensis, both of which were planted here during the nursery years. The problem with these plants is their ability to grow again from the tiniest bit of root. First we removed every scrap of plant visible above ground and all the roots we could find. We plan to use a carefully directed herbicide on the bits that return. Although we hope for success if not complete eradication, we expect control. More fall bulbs come into flower every day with clumps of rhodophialas in bloom near the corner of the May garden, and Prospero autumnalis, Acis autumnalis, and Cyclamen graecum in bloom beneath the deodara cedar. Cyclamen hederifolium blooms throughout the woods. The summer continues to produce a few flowers and a lot of complaints. We complain because we are so incredibly dry. When we moved to Montrose and began our garden, I decided to try to make a garden without an irrigation system and without watering the beds in between rains. My solution is to plant them shortly before a rain, to spread mulch over the surface of the beds after we plant, and to hand water the new plants for a week or so. This year has been a challenge. We planted when the weather forecasters led us to believe we would receive rain within a day or two. Alas, we have not had a good rain for weeks now. Dark clouds appear in the late afternoon sky and seem to vanish over Hillsborough. 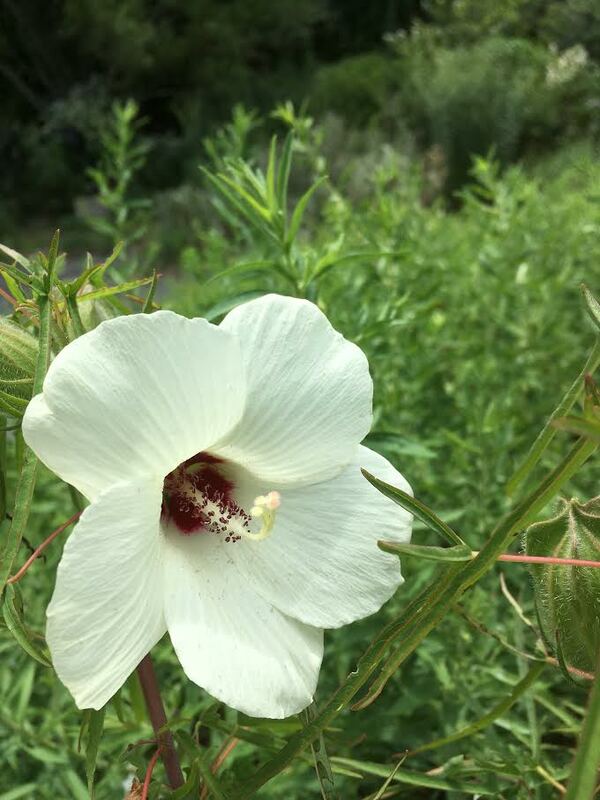 Some of our most reliable plants, which bloom without our adding water, include hibiscus, both chance seedlings and the ones we planted years ago. They look as good as if we had watered them daily. The surprise about this is that most hibiscus have the reputation for craving water. Our favorite, H. dasycalyx, never begs for water and has narrow leaves, a shaggy calyx, and creamy white flowers. This species seeds around in the garden; one of our best plants grows in one of our driest places—right in the middle of a gravel path in full sun. Yes, Hillsborough soil is special! We recently cut the dead limbs and removed most of the lowest branches from a large yew, a Canadian hemlock, and an unidentified corylopsis, which grow near the driveway. Now we can walk under these large trees, see their structure, and look across the bed to the center of the circle garden. Our next challenges are to remove the ivy and poison ivy, which grew in their shade. That will be my job for I am the lucky one—not allergic to poison ivy! By this time every year we have felt the intense, heavy heat of summer in central North Carolina. We know we have almost 3 more months of this weather and so we look for signs of fall. One of the most delightful small fall-named bulbs, Prospero autumnale, blooms near the deodara cedar. We met this plant first as Scilla autumnalis, and began with one bulb, planted in the rock garden. Year after year that one bulb appeared as a beacon of hope at the beginning of summer and one year I looked more closely and saw a stem containing lots of seeds. From that year until this, we have collected and planted at least one pot full of seeds. The first generation of seedlings went under the deodara cedar where they grew and spread until now we have a mass with seedlings coming up and blooming in the lawn nearby. On my evening walk last week I found a Cyclamen hederifolium with two flowers along the cyclamen path in the woods. We settled into the work of early summer and began clearing off the sunny gardens. 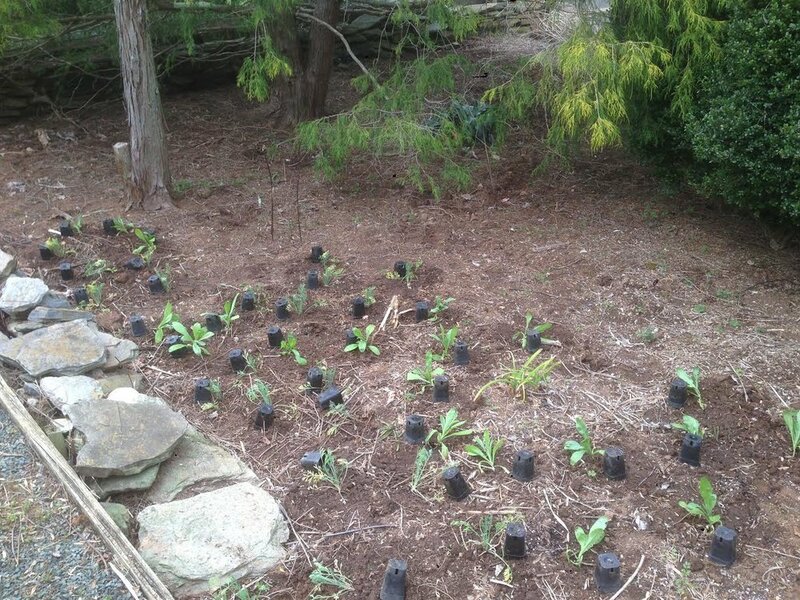 We removed more bananas, and Saponaria officinalis, an attractive nuisance throughout the May Garden. We took loads of debris to the compost pile and the brush piles. “Good” debris, i.e. that without seeds or invasive roots go to the compost bins and “bad” debris, that with seeds, woody stalks, or bulbous roots go to the brush piles. Our final challenge this year is the presence of a doe and her fawn, so later this week we will have a deer drive in the hope that she will realize the grass really is greener on the other side. Wish us luck! After a remarkably cool, pleasant week, we are now in heat of summer. Recent rains keep the lawns and fields green and many newly planted seedlings and perennials settled down in their new locations within a few days. I had hoped to write about yuccas, some with ivory flowers on stalks five feet high. They came and brightened the corners of the beds but most are over now and so we have cut them down. Sometimes we can just bend the entire stalk bearing leaves and flowers, all the way to the ground and it will break off at the base; however, most of the time we have to saw the base of the blooming division to remove it and stimulate the growth of a new rosette. Masses of larkspur with flowers in shades of blue, white, lavender, and pink continue to bloom while most of the other spring annuals are going to seed. Poppies have lured goldfinches into the garden and they sing all day as they go from plant to plant. Our challenge is to collect the ripe seeds we have marked as special—bright shades of red, purple, burgundy, raspberry as well as pure white. Goldfinches aren’t the only creatures that like poppy seeds. Mice quickly discover the gathered seed if we leave it where can be found in the potting room or law office. This year, we have them in open bags in the laundry room in the house in hopes that the mice won’t find them there, and so far, they haven’t. Nigella is another annual from which we collect seed. We can pop off the seed heads and shake the ripe seeds into sacks, ready to be packed up for sale during our fall open day. While the annuals fade, recent rains have given us the best show of hydrangeas ever and both sterile (mop head) and fertile (lace cap) forms brighten the shady gardens. Where the spring annuals once thrived, lilies and gladiolas now add splashes of color throughout the gardens. 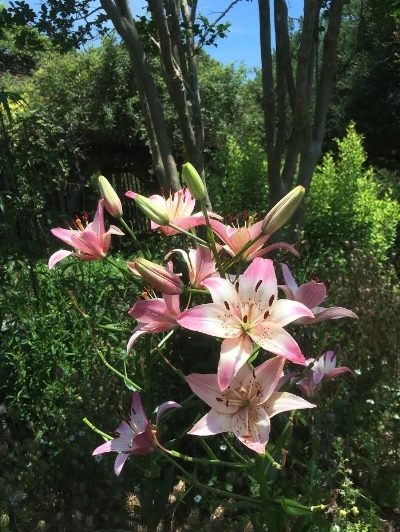 Lilies bloom in the May garden. 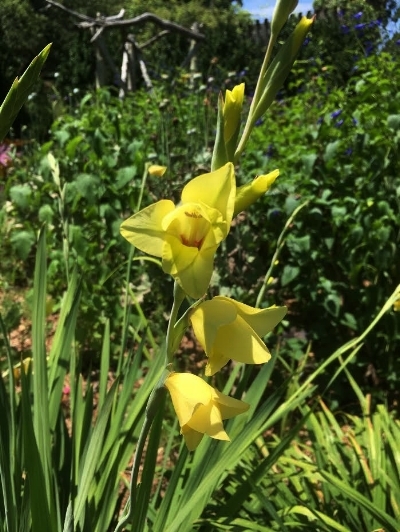 A soft yellow gladiolus in the color gardens. We celebrated the garden on May 12 with an open day and record-breaking heat, which followed weeks of intense weeding, pruning, and weather worries. The poppies were not in bloom, but roses stole the show. Not only were they covered with flowers, but they perfumed the garden in a delightful way. There were sections where the flowers were not very showy but the fragrance made us stop to “smell the roses”, which seemed a trite statement until we actually did it. The star of the day was Rosa ‘Hippolyte’, a shrub Gallica that had grown out into the path and was covered with double, dark mauve flowers. Although this rose blooms but once a year, we are always thrilled to see it. Other roses covered the fences and lath house and we were amazed at the sight of R. ‘Dr. W. Van Fleet’ climbing through a large Chamaecyparis. Three plants of this rose grew along the cedar post and wire fence at the north end of the kitchen garden when we moved to Montrose in 1977. We left them there, replaced the fence, and they have never failed to please us with their profusion of double flowers, fragrance, and delicate pink color once a year. Their more famous sport, ‘New Dawn’ is similar but a little less exuberant possibly because it blooms throughout the summer. Several days of wonderful rains brought forth flowers on nigella, larkspur, and poppies and transformed the sunny gardens into fields of color. We emptied the greenhouses and set many agaves into their usual urns and rain that evening began to change them from anemic-looking specimens to healthier looking plants. We began cutting back asters, chrysanthemums, and teucriums in the hope of controlling their naturally lax habit and welcomed the first flowers on Yucca rostrata, at the entrance to the circle garden. Seeds are rapidly ripening so we collected cyclamen, Delphinium tricorne, and Enemion biternatum and planted them right away. We said goodbye to spring and welcome to summer. Poppies in full bloom with a backdrop of roses. As the flowers on the tree peonies here at Montrose fade and fall, they leave behind many promises in the form of seed capsules, some of which are colorful, all of which won’t ripen until mid-summer. Our focus is on preparing Montrose Garden for open day in two weeks. We pruned the woody salvias by cutting away woody stems without buds or leaves and then removing some overgrown branches to let in light and air to plants nearby. This will help stimulate new growth. Hydrangeas get similar treatment, but sometimes I wonder how appropriate these shrubs are for our climate. Year after year the tip buds expand too far before the last freeze and flowers never develop. This year we cut lower on the stalk in the hope that we will see swelling buds and flowers by June. The Trillium Slope lures us down every day for Primula sieboldii and the Trilliums cuneatum, luteum, lancifolium, and a few grandiflorum continue to bloom and are accompanied by my mother’s yellow ladyslipper orchids, Cypripedium calceolus. Irises bloom throughout the garden—in sun and in shade. Iris tectorum and cristata grow best in the woods, rock garden, and shady areas in the perennial borders while I. sibirica and I. germanica prefer the sunny borders. Aquilegias in almost every color brighten the gardens in both sun and shade. We enjoy the subtle, soft green and brown of A. viridiflora and the yellow form of A. canadensis but our main show consists of self-sown A. vulgaris, most of which are purple/blue, or pink. Primula sieboldii blooming on the Trillium Slope. 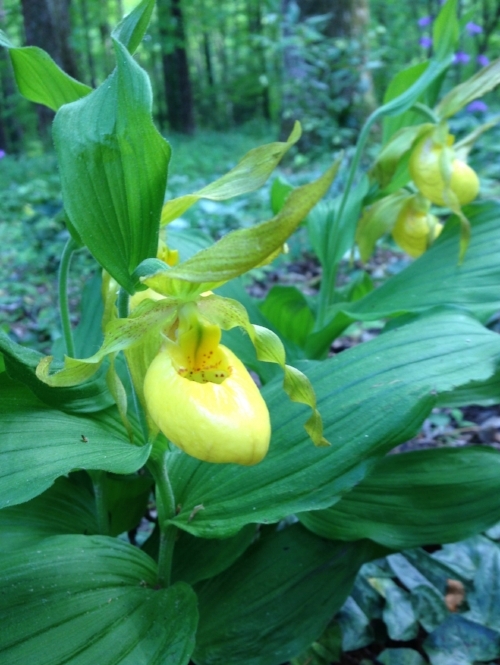 Cypripedium calceolus blooming on the Trillium Slope. Besides weeding, which is our main occupation during this season, we also pot on seedlings, divide plants, and fill in the gaps in the borders. We revised a large section of the Blue and Yellow garden last week, and replaced the aggressive Salvia guaranitica with chartreuse-leaved hostas, Carex morrowii, Irises and a few blue grasses. The Dianthus Walk has never been prettier. 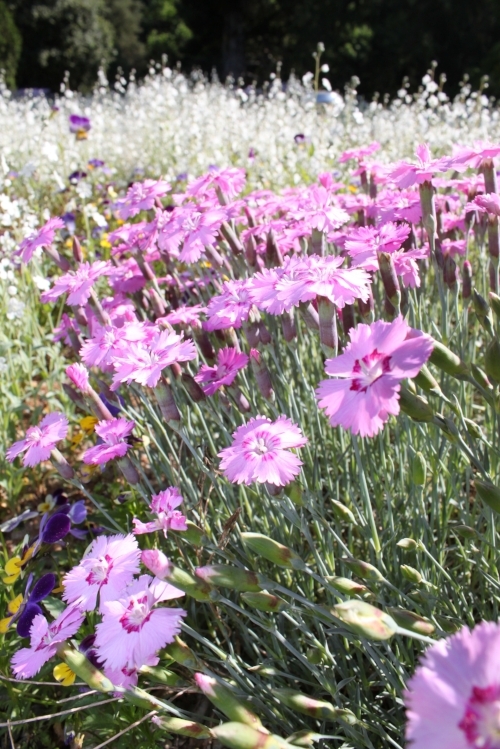 A cooler than normal April kept the phloxes in bloom and now the many varieties of Dianthus have joined them with their fragrant flowers in white or shades of pink. Dianthus in bloom on the Dianthus Walk. 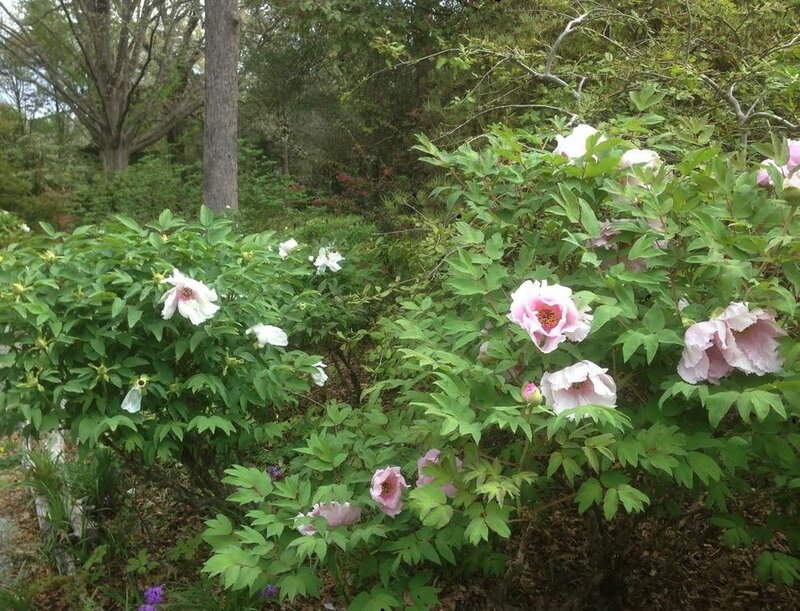 By the end of last week, many of our tree peonies were in full bloom. 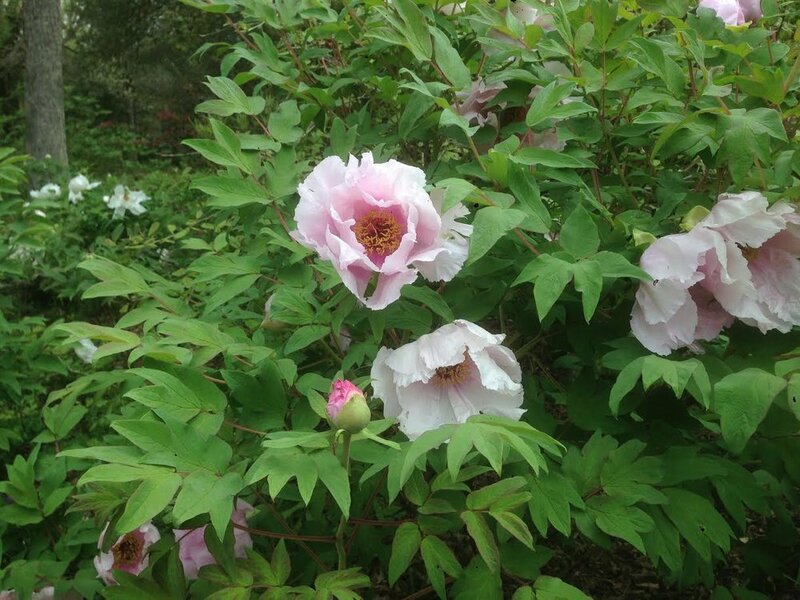 We have many forms of Paeonia ostii with flowers in shades of pink or white. Most flowers are about 5 inches in diameter with slightly ruffled leaves and all are fragrant. We love seeing them early in the morning when, in order to protect their sexual parts, their outer leaves are gently laid across the pistil and pollen bearing anthers. We stand in the center of the circle garden and breathe in the heavenly scent. Yesterday we discovered a splendid second generation seedling, which we suspect was pollinated by another species. Trilliums fill the gardens along the mother-in-law walk and the entire garden is overlaid with Enemion biternatum’s delicate white flowers. The enemion began to bloom at Christmas! A large planting of Arisaema sikokianumin full bloom lures us down to the new woods path every day and once there we continue to see the spring cyclamen, which continue to delight us. Both Cyclamen pseudibericum and C. repandum have flowers in shades of pink. As for C. hederifolium, it’s all leaves now—big beautiful leaves, which are green overlaid with delicate patterns of lighter shades and some that are all silver/gray. Last weekend Montrose had what we hope is our last little snow storm for this winter. Large, fluffy flakes began to fall in late afternoon, quickly covered the lawn, and continued throughout the night but by morning, we had a snow-covered lawn and uncovered paths. Clumps of the smaller daffodils, Narcissus bulbocodium and fernandesii, never even bent with the snow and the day was warm enough for hand weeding in the rock garden and dianthus walk. The large planting of Arisaema sikokianum remained half open and those plants are only now showing their pure white knobs (spadix) below unfurling chocolate striped spathes. We spent much of this week weeding out a tiny blue-flowered annual veronica, which was growing vigorously in the sunny garden, and crowding out the poppies we seeded in November. We hope that more poppies will germinate and grow now that the beds are weeded. By week’s end we saw promises of warmer weather and above freezing nights here at Montrose so we transplanted calendulas and eschscholzias at the edges of the beds. Every evening we walk along the new primrose path now filled with plants just beginning to bloom. We walk over the next ridge to see Cyclamen repandum with flowers in shades of pink and visit our largest planting of C. pseudibericum blooming with deep magenta flowers along the road to the pond. The large planting of mid-season narcissus at the edge of the field has begun to fade and the next group are in full bloom. N. ‘Thalia’ grows south of the cyclamen walk and remains one of our favorites with twin white flowers. Let’s hope April is not the cruelest month this year! A newly planted bed of Calendula and Eschscholzia in the sunny gardens at Montrose. The pots are left alongside the plants as a reminder, once the planting has been thoroughly watered, fertilized and mulched we pick them up. February at Montrose Garden left us feeling as if we were in the midst of spring. Blooming magnolias, narcissus, primroses, and bloodroot gave us color and worry. March roared in at the end of last week bringing with it “normal” temperatures, rain, and wind. It's the time of year to prune the shrub roses in the sunny gardens so we removed dead wood and excess growth in the center of each plant. We cut back the longer healthy stalks just above an outward facing bud to direct its growth outward, leaving the center with plenty of air flow. Lastly, we fertilized with Rose Tone. A cold but gentle rain gave us the perfect conditions for planting primroses. These plants were grown from seeds set by us in the spring of 2016 and sown in early fall of that year. The seeds germinated quickly and when transplanted into individual pots, grew into vigorous plants by the spring of 2017. Ideally, we would have planted them in the fall of that year but because we were in the midst of a serious drought, we left them in a shallow cold frame until last week when we selected the best colors and forms for sale and for our garden. Now we have a real primrose path with masses of flowers. With luck, this cool weather will remain with us for an extended period and the new planting will lead us to visit this section of the garden daily so that we will begin the process all over and pollinate the best of each type. We also pollinated several narcissus species as well as the delightfully fragrant roman hyacinth, Hyacinthus orientalis. We started working in the sunny gardens and began to clear off each garden while also thinning the spring blooming annuals so the remainingseedlings can grow into better, stronger plants. We have also been working on repotting and dividing potted plants in the cold frames to get them ready for sale or to be planted in the garden. We divided many species of the terrestrial orchid, Bletilla. 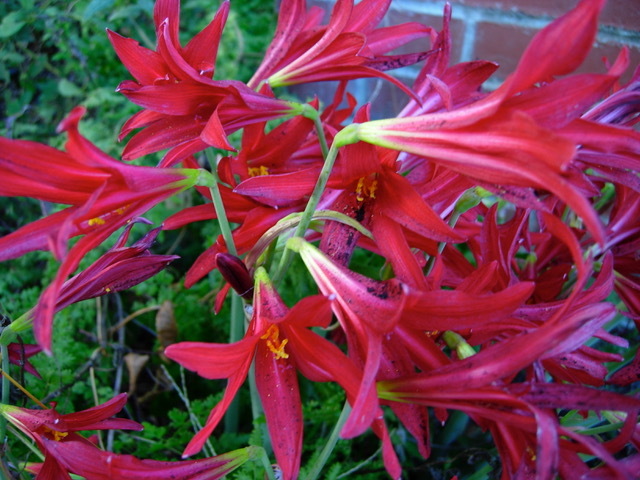 Some bulbs were potted for sale while others were saved for stock and some were planted in the garden. 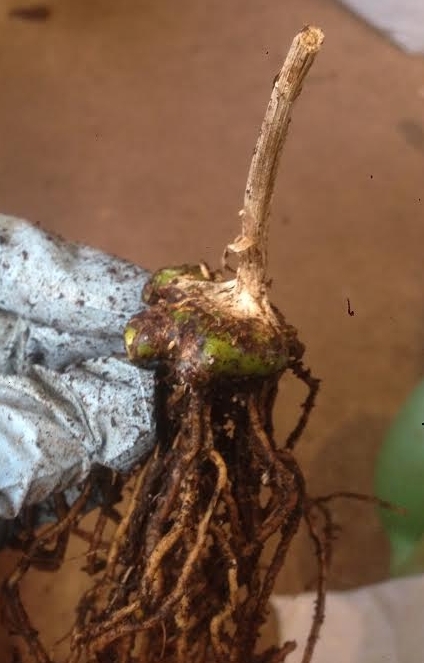 Trillium seed that had been sown in 2013 had finally made many tiny, healthy looking plants that were also potted to grow on and sell. 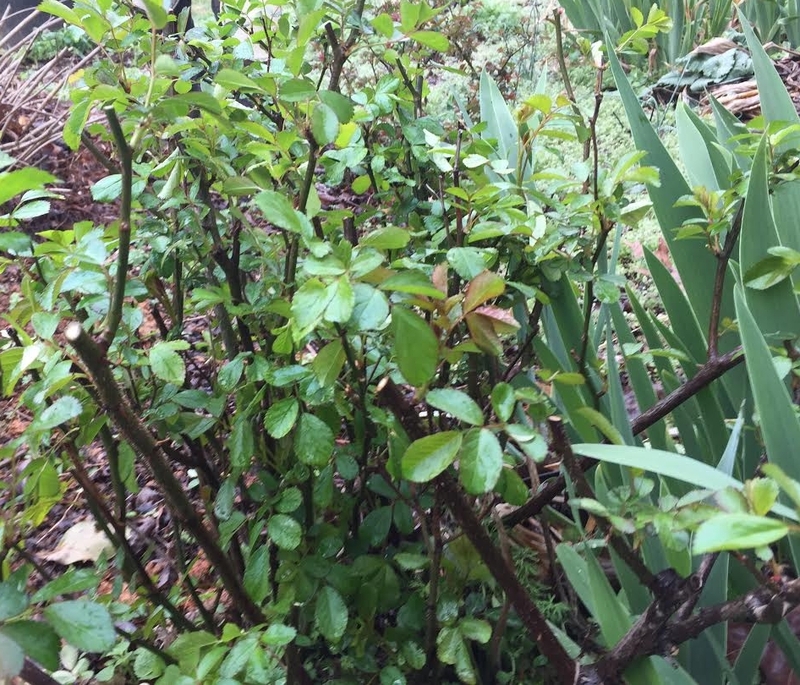 Before pruning, this rose is crowded in the middle and has some deadwood. After pruning the main stems of the rose have been cut back significantly, the deadwood has been removed and the middle has been opened up to allow for more airflow. A closer picture of the same rose after pruning, some of the cuts made are visible here. Below you can find the process of dividing and repotting Bletilla 'Innocence',which we grow here at Montrose Garden. This is Bletilla 'Innocence' before being divided. The pot is overcrowded with bulbs that can be split up and repotted to make individual plants. This back bulb that has been divided from the group has no shoots but will be replanted and make a flowering plant next year. This bulb with a shoot of new growth will flower this year and will be repotted to grow on for sale. Here are the freshly potted Bletilla, about four individual plants came from the original pot shown. What happened to our winter? Where are those cold nights and crisp mornings when we wear so many layers of warm clothes we can barely move? Those morning when, after moving, pulling little trees, ivy, honeysuckle and other woodland pests, we remove layer after layer? Hydrangeas have begun to expand their buds, the later flowering narcissus are in bloom, and snowdrops droop ready to return to the slightly cooler earth. We even saw the first bloodroots in flower this past Friday. The appearance of these long-awaited plants and flowers excites us but we worry about their survival. Will there be a devastating cold snap to destroy the ever-swelling buds on trees and shrubs? We don’t know. We work outside almost all day every day, even in the winter. This winter at Montrose we concentrated on our collection of hellebore species, and hand pollinated our favorites hoping to offer seedlings in a few years. We divided many clumps of narcissus, which were growing so tightly together they couldn’t bloom. We dug them, then divided and replanted each one into the area where we have other spring flowering bulbs at the edge of the field. We spend many happy days in the woods, where we cleared weeds and saplings and planted another terrace with snowdrops. This new area is about 100 yards long and Bruce, our fantastic volunteer’s husband, estimated that this ridge now contains about 4600 bulbs all divided from the snowdrop woods this winter. We will start seeds soon for plants to put into the garden when we believe the warmth is here to stay. We divide and replant perennials for sale in fresh soil, and we take cuttings of suitable plants that we expect will root at this season. 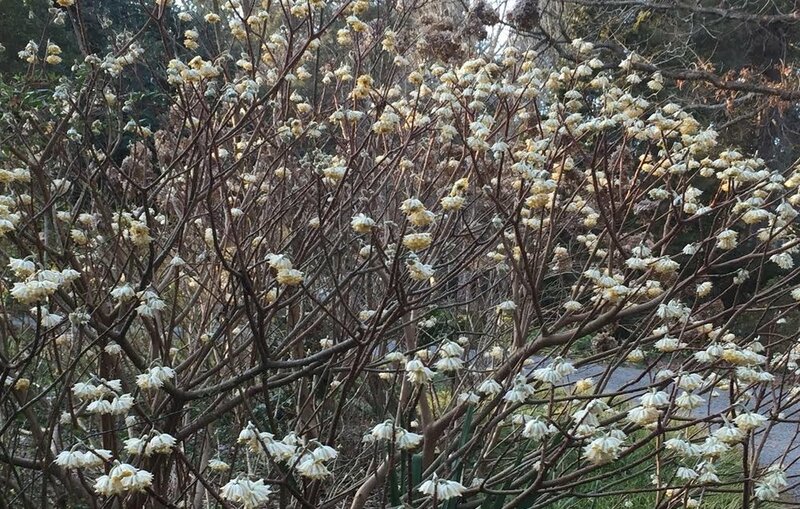 We don’t stop to smell the roses yet but we do stand near Tony Avent’s great introduction, Edgeworthia chrysantha ‘Snow Cream’, and rejoice that we are able to grow such a treasure. 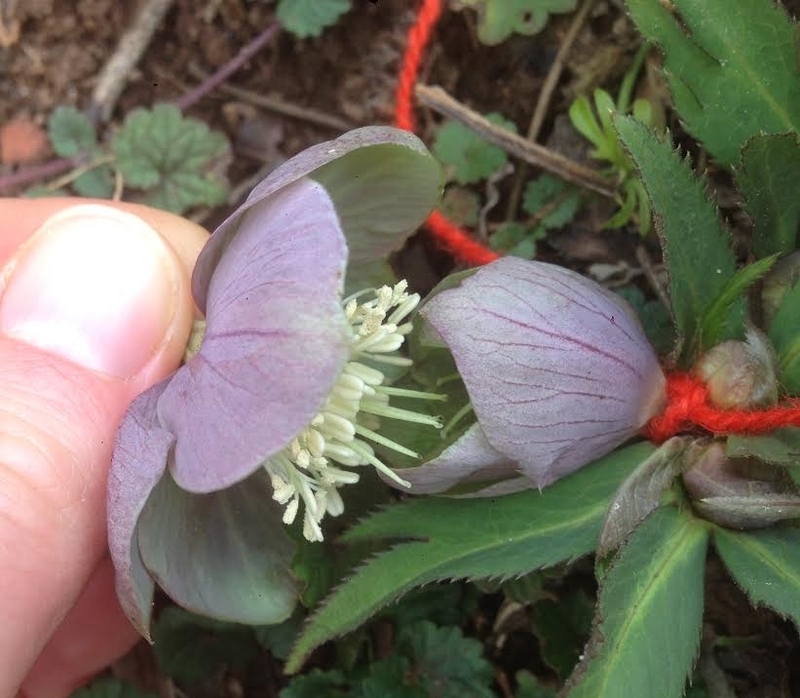 The images below illustrate the process of pollinating the Hellebore, Helleborus purpurascens. This species is pollinated so that we will be able to collect ripe seed in mid March, the seed will then be sown, and grown on. Here, you can see the ripe pollen on the stamens of H. purpurascens. At this stage in the flowers life the stigma is no longer receptive. Here, you can see the stigma of an H. purpurascens flower that are ready to be pollinated, notice that on this flower the stamens are not yet forming pollen. Here, the pollen from the first flower shown is being used to pollinate the stigma of the second flower shown. The flower that will produce seed is marked with a red string so that it can be watched for ripe seed. Subscribe to our mailing list to receive updates and garden news.